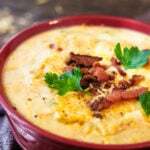 This easy potato soup recipe is absolutely delicious. It's easy and quick to put together and definitely a meal the whole family will love! In a large dutch oven, cook strips of bacon until crispy. Remove from pan. Cook the carrots, onion, and celery in bacon grease until the onions are translucent. Add potatoes, salts, and pepper. Mix well, and let cook for a few minutes. Add chicken broth and bring to a simmer. Simmer until the potatoes are very soft, about 15 minutes. Blend the soup, if desired. I do this with an immersion blender but you can also transfer the soup to a blender. Be VERY careful when doing this, as hot liquids will expand. Never fill the blender over halfway with hot soup. Add the hot sauce and milk. Add the milk gradually until the soup is as thick or thin as you prefer. You may not need to use all of it. Add the chives and parsley and adjust seasonings or consistency, if needed. I like to serve with sour cream, cheese, and then crumble the bacon on top.